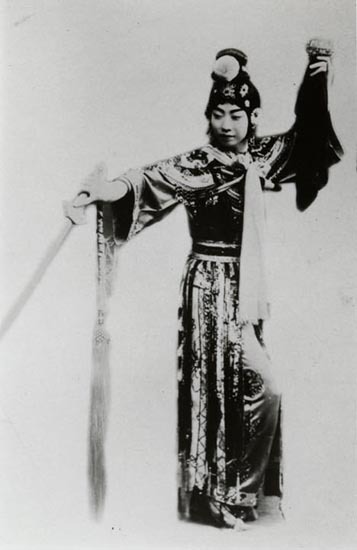 I soon learned that there are two main types of Chinese Opera, and I’m talking about the 78 rpm era here, Peiping Opera (aka Peking or Beijing) and Cantonese Opera. Peiping Opera is a bit more “classical” while Cantonese style is a bit more “folk”. It’s good to keep in mind that the history of opera music in China, which was more or less their theater, folklore, and music all rolled into one, is a long and complicated story going back hundreds of years. I’m definitely not qualified to make any definitive statements about which style is older or the tangled webwork of influences. 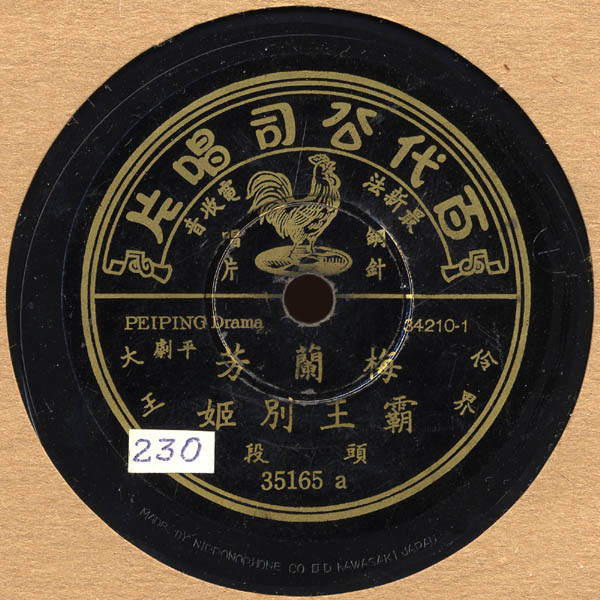 Peiping Drama, which is what this record is labeled as, usually consists of a fiddle-like instrument called Erhu or Jinghu, or one of the variations on it, and a handful of other stringed instruments. The general cacophony is provided by a rhythm section consisting of gongs, cymbals, woodblocks and such. The singing is in an unnaturally high voice, often sung by men performing the role of a woman (qingyi) and using stylized, archaic words with special pronunciation. This style tends to be much more wild than the Cantonese, with a lot of percussive effects that would be used to accompany physical action on stage such as acrobatics, elaborate fight scenes, hand gestures and general posturing. Here, then, is a pretty typical example of this style, I’m guessing from the 1920’s. It seems to me that Pathe recorded the most records in this style while other labels tended to record more Cantonese. The singer is the “Opera King”, Mei Lan Fang, the internationally famous male singer known for qingyi roles. See the film Farewell My Concubine for some nice depiction of this. This is the strange story of a famous emperor who is despondent over the loss of his men in battle. The opera culminates with a famously complicated, stylized sword dance performed by his concubine as she commits suicide to express her loyalty to the emperor! Great music! Excellent first post! The world needs more. Good stuff you’ve got here! Well, actually no. Every region and locality of China has its own type of opera(s). Even if we’re just counting the “main” types of Chinese opera, there many many more than only two! Each type, including Cantonese opera, would be limited to its own region and/or its people, except for Beijing opera which has become a sort of “national” opera. Thanks for the comment. I agree, there’s many types of opera. I was just making a generalization about what was recorded on 78 rpm records. By far Peking (aka Beijing or Peiping) and Cantonese were the two most commonly recorded styles. Cantonese made up the majority of Chinese immigrants in the USA and so was recorded more often…in fact Cantonese opera in New York and San Francisco was the first stuff recorded. I kinda guessed that’s what you meant. Yes, historically, the majority of Chinese emigrants have originated from just a small corner of China, relatively speaking, namely Fujian and Guangdong. So the sort of Chinese things, culture, language etc that gets brought to the world outside China can be unrepresentative of China as a whole, at least historically. For example, I bet most Americans would be surprised by the fact that over 95 percent of all Chinese people do not speak Cantonese. Obviously record companies record the type of music that would appeal to the buyers they are to selling to. 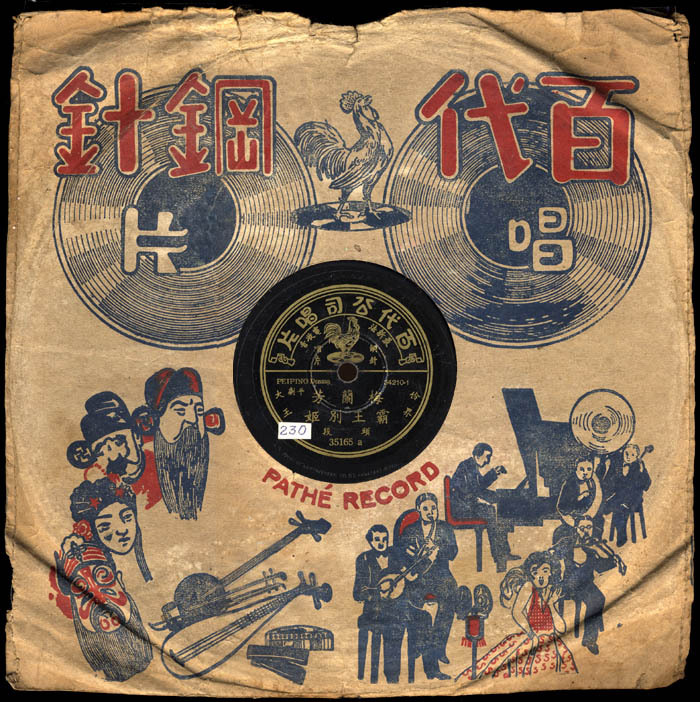 So I guess that’s why you would find more 78s of music from Fujian and Guangdong on non-Chinese record labels. The opera that this record is from is perhaps better known as “Ba Wang Bie Ji”. It’s the same title as the film Farewell My Concubine. Thanks again for posting these wonderful and rare old records.